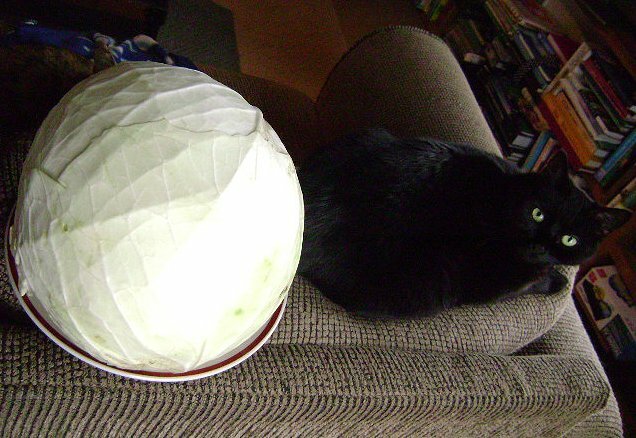 Until I found out that Alaskan gardeners were the champs in growing gigantic brassicas, I was quite proud of this rather large cabbage that I grew last summer. It was bigger than my cat Simon. It was bigger than Lulu. It was bigger than Martha's big, bony head. 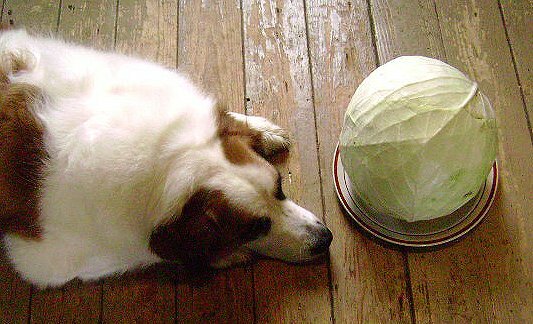 It was a great cabbage. But Alaskan gardeners, though they have a short growing season, have the perfect cool, wet growing conditions to coddle their cabbages into great big mammoths, so this honking big ball of cabbage was just a champion in my own record book. As I recall, I did get two batches of coleslaw, a stir fry and a lovely side dish of cabbage sauteed with caraway out of that one cabbage. 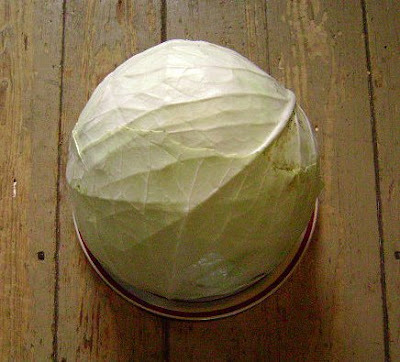 Cabbage was on my mind again last week when I purchased a small head to mix into a dish that I wanted to refashion into a gluten-free version. Many years ago, I sampled a great cabbagey salad at an office potluck and got the recipe from my co-worker. It involved some sliced cabbage, its Chinese cabbage cousin, and crushed up ramen noodles in a sesame-drenched dressing. Tasty. Bring a large pot of water to a boil. Drop in mai fun and let soak 10-15 minutes or until they are springy but soft. Drain and chop up a bit. Mix in large bowl with cabbages and scallions. Melt butter in frying pan and add almonds and sesame seeds. Saute until light brown and fragrant, stirring all the while so they don't burn. Add to cabbage salad. Mix oil, sugar, rice vinegar and soy sauce until sugar dissolves. Pour over salad and toss well. Let sit at room temperature at least 30 minutes before serving to let flavors meld. I really loved noshing on this sweet-salty-tangy salad and will be making it for company during the warmer weather. I am sending over this cabbagey post to this week's edition of Weekend Herb Blogging, which is being guest hosted by Anh of A Food Lover's Journey. Weekend Herb Blogging is headquartered at Cook Almost Anything and you can find out all about this veg-centric weekly blog event and the rules for posting on that terribly tasty site. 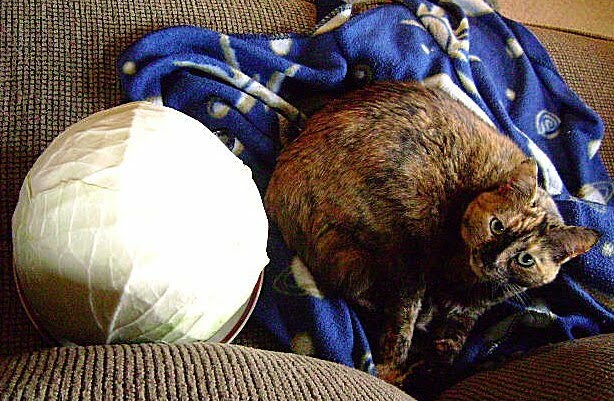 Love the cats as a measure of cabbage! So funny about that salad - it's the one on the Chang's Crispy Noodles packet and I have never met anyone who didn't like it! I trek to an Australian shop just to get the right noodles! We just rented a garden plot and we are excited to grow some veggies this year. I think cabbage will be on the list.